We’d love your help. 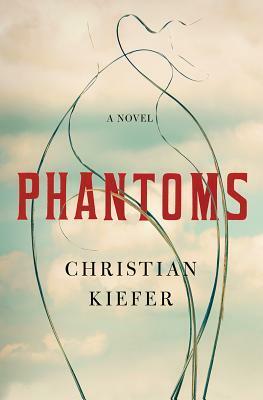 Let us know what’s wrong with this preview of Phantoms by Christian Kiefer. In the panoramic tradition of Charles Frazier’s fiction, Phantoms is a fierce saga of American culpability. A Vietnam vet still reeling from war, John Frazier finds himself an unwitting witness to a confrontation, decades in the making, between two steely matriarchs: his aunt, Evelyn Wilson, and her former neighbor, Kimiko Takahashi. John comes to learn that in the onslaug In the panoramic tradition of Charles Frazier’s fiction, Phantoms is a fierce saga of American culpability. A Vietnam vet still reeling from war, John Frazier finds himself an unwitting witness to a confrontation, decades in the making, between two steely matriarchs: his aunt, Evelyn Wilson, and her former neighbor, Kimiko Takahashi. John comes to learn that in the onslaught of World War II, the Takahashis had been displaced as once-beloved tenants of the Wilson orchard and sent to an internment camp. One question has always plagued both families: What happened to the Takahashi son, Ray, when he returned from service and found that Placer County was no longer home—that nowhere was home for a Japanese American? As layers of family secrets unravel, the harrowing truth forces John to examine his own guilt. To ask other readers questions about Phantoms, please sign up. I received a free advance reading copy of this book through the Goodreads Giveaways program and would like to thank anyone involved in making that happen! This is a quietly beautiful novel that deals with the aftermath of war and how it reverberates through generations. It tells the heartbreaking story of two intertwined families, ripped apart by World War II and tenuously reunited by old family secrets and mysteries after the Vietnam war. This novel is a gorgeously written, slow-burner, with a s I received a free advance reading copy of this book through the Goodreads Giveaways program and would like to thank anyone involved in making that happen! This book tells the tale of a Vietnam war veteran walking through history with two women who lived through World War II - specifically on two different sides of the Japanese internment. John, the veteran, takes us through a whirlwind of history while struggling with his PTSD, going back and forth between the sixties as he lives through Evelyn Wilson and Kimiko Takahashi's meeting nearly twenty years after the war ended, their tension, valid, still existing over trouble between their families and This book tells the tale of a Vietnam war veteran walking through history with two women who lived through World War II - specifically on two different sides of the Japanese internment. John, the veteran, takes us through a whirlwind of history while struggling with his PTSD, going back and forth between the sixties as he lives through Evelyn Wilson and Kimiko Takahashi's meeting nearly twenty years after the war ended, their tension, valid, still existing over trouble between their families and the aftermath of the war. Phantoms by Christian Kiefer is told from a recent Vietnam Vet's point-of-view. John Frazeier comes home from Vietnam not knowing what to do with his life. A broken young man, like most who came back, and has decided to spend time with his Grandmother and a distant Aunt. The story floats through several decades, from before World War II to 1983. It also includes the lives of several different families, the Takahashis, who were displaced and sent to an interrnment camp during the second world war Phantoms by Christian Kiefer is told from a recent Vietnam Vet's point-of-view. John Frazeier comes home from Vietnam not knowing what to do with his life. A broken young man, like most who came back, and has decided to spend time with his Grandmother and a distant Aunt. The story floats through several decades, from before World War II to 1983. It also includes the lives of several different families, the Takahashis, who were displaced and sent to an interrnment camp during the second world war, the Wilson's, who owned the land the Takahashis lives on and rented a place on, and Frazier himself, as a war hero who wonders what happened to another war hero, of a different time. Ray. Ray Tahahashis arrived home after serving in WWII to find that his family had been removed, and that he was no longer welcome. Then he disappeared. After losing friends, John finds that he can't let the story go, and finds himself obsessed later in life with the outcome. As a story that involved different time periods it was interesting how these stories intertwined. Seeing a man coming home from the Second World War to find his family and everything he loved gone, then to find out later what happened and how much life had screwed him over, was upsetting and fascinating. Most won't think of the repercussions of the life some leaves behind and the life they return to, especially given the time some soldiers spent away, and still spend on deployment. After most wars, the man or boy sent away is not the man or boy who comes back, and often the lives they are coming back to is not the same either. Ray finds this to be the truth when he returns to what he thought of as home, only to find that everything has changed and he is no longer welcome. As the story moves on the reader gets to see how unwelcome Ray is when the woman he loves and the people of the town react to him in an unexpected way. Decades later, when John returns from Vietnam with the same kind of feeling about where home is, he find himself embroiled in discussions between his distant Aunt, Evelyn Wilson, and Ray's mother Kimiko Takahashi, who only want to know where her son is. Evelyn Wilson however is full of secrets that she is unwilling to share, keeping a family in the dark, and creating more and more unnecessary heartache. John, is dealing with his own issues, memories and ghosts from his time in Vietnam. He spends some time with another soldier who was with him, Chigger, but in the end, no really gets their happy ending. This novel not only shows a portrayal of what it looks like for a soldier to come home, but also what secrets can do when left unspoken. One family doesn't find out the entire truth, and another searches for something that they let go of. In the end, there isn't justice for anyone, even John loses by not reaching out to someone he should have reached out to. There are parts of this novel that were hard to read, especially as someone who has been military for most of their life and who has sent men off to war. Parts of this novel were hard to read because of the blatant racism and disgust that some of the character portrayed, Evelyn Wilson was not a pleasant person, and neither was her daughter, Helen. Christian Kiefer has released one of the most poignant tales of the divide between two American families. Takahashi and Wilson's families shared a tale in a time filled with American ethnocentrism which rings of truth even today! John Fraiser parallels his time in Vietnam with Ray Takahashi time in WWII with similar experiences upon their return home, the abandonment and loneliness suffered by each. John's love for his grandma and sharing remembrance with his war brother, "Chiggers" and their tor Christian Kiefer has released one of the most poignant tales of the divide between two American families. Takahashi and Wilson's families shared a tale in a time filled with American ethnocentrism which rings of truth even today! John Fraiser parallels his time in Vietnam with Ray Takahashi time in WWII with similar experiences upon their return home, the abandonment and loneliness suffered by each. John's love for his grandma and sharing remembrance with his war brother, "Chiggers" and their torment too heavy to view in hindsight. Kirkus gave it a starred review and these similar suggestions: Snow Falling on Cedars and Cold Mountain. NoveList Plus gives it this read-alike: Go Set a Watchman. Phantoms is the first CK book I've had the pleasure of reading. I picked up a copy at AWP last Saturday and wasn't sure what to expect but I was blown away! I devoured this book in one long, delightful, fully absorbed sitting. I can't say enough about this book. It is beautiful, yet haunting and totally relevant today. I'll be talking this one up for awhile. I can't wait to read more by this author. I was hooked on this story from the beginning. It was interesting how two totally different wars were tied together through family and emotion. Phantoms tells the disturbing intertwined stories of two families that are broken apart by World War ll and delicately reunited by old family secrets after the Vietnam war. This is a wonderful novel that traces the effects of war and how it affects so many lives for years and years. The book is well written, the plot was riveting and I was completely drawn into the story. I highly recommend it. Thanks to Netgalley and the publishers for this book in exchange for an honest review.